Last Sunday, the FAA and the White House released long-awaited documents to clarify the lawful use of drones, or unmanned aircraft systems (UAS) in the National Airspace System for "non-hobby or non-recreational purposes." These proposals will directly affect communities across the country as residents increasingly experience UAS operations in their daily lives. The FAA’s proposed rule reduces existing barriers to commercial UAS use and sets the stage for greatly increased use of UAS by commercial, private and research users. 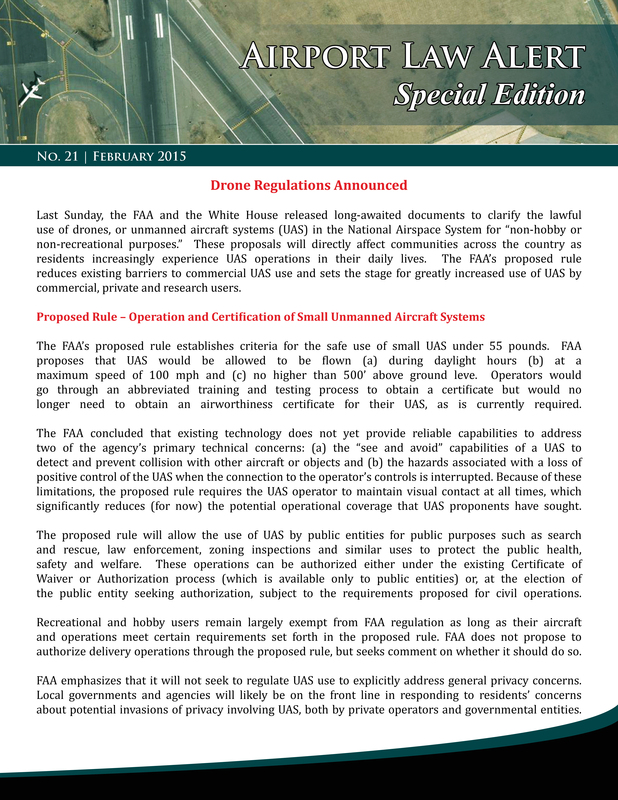 The FAA’s proposed rule establishes criteria for the safe use of small UAS under 55 pounds. FAA proposes that UAS would be allowed to be flown (a) during daylight hours (b) at a maximum speed of 100 mph and (c) no higher than 500’ above ground level. Operators would go through an abbreviated training and testing process to obtain a certificate but would no longer need to obtain an airworthiness certificate for their UAS, as is currently required. positive control of the UAS when the connection to the operator’s controls is interrupted. Because of these limitations, the proposed rule requires the UAS operator to maintain visual contact at all times, which significantly reduces (for now) the potential operational coverage that UAS proponents have sought. The proposed rule will allow the use of UAS by public entities for public purposes such as search and rescue, law enforcement, zoning inspections and similar uses to protect the public health, safety and welfare. These operations can be authorized either under the existing Certificate of Waiver or Authorization process (which is available only to public entities) or, at the election of the public entity seeking authorization, subject to the requirements proposed for civil operations. Recreational and hobby users remain largely exempt from FAA regulation as long as their aircraft and operations meet certain requirements set forth in the proposed rule. FAA does not propose to authorize delivery operations through the proposed rule, but seeks comment on whether it should do so. FAA emphasizes that it will not seek to regulate UAS use to explicitly address general privacy concerns. Local governments and agencies will likely be on the front line in responding to residents’ concerns about potential invasions of privacy involving UAS, both by private operators and governmental entities. Along with the release of FAA’s proposed rule, the White House issued a Presidential Memorandum (a) requiring that federal agencies’ use of UAS adhere to existing privacy, civil liberties and civil rights protections embodied in the US Constitution and federal law, and (b) establishing an effort to be led by the Department of Commerce to create privacy protection standards for the commercial or private civil use of UAS. The Presidential Memorandum requires all federal agencies to update their policies and procedures to address the use of UAS and to restrict the collection and dissemination of individuals’ personally identifying information that may appear in records maintained by the federal government. A PDF of this special Airport Law Alert is available.